The President of Estonia tore off his glasses and earpiece in an interview with Sky News’ Dermot Murnaghan after the presenter called him by his middle name by mistake. 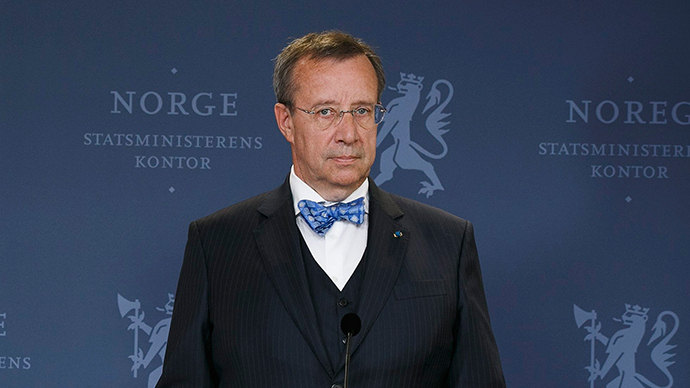 Toomas Ilves was about to do an interview with Murnaghan via live video link from the security conference in Munich about Estonia’s response to comments by the UK defense secretary Philip Hammond that Vladimir Putin was acting like a “mid-twentieth century tyrant”. But Murnaghan called him by his middle name Hendrik, which Mr Ilves was not happy about. Firstly he interrupts the presenter and then takes off his earpiece and glasses, looking more bemused than angry. Murnaghan, ever used to the trials of live television, smoothly moves on and takes a look at the weather. The interview was apparently resumed later in the day. Last month Chuka Umunna, the Labour business secretary, stormed out of a Murnaghan interview after he was asked a question about Eric Pickle’s letter to mosques in the UK. He said there had been a misunderstanding about what he would be required to talk about on the show and offered to talk about the general situation facing young Mulisms in the UK. To which Umunna said Murnaghan was being “ridiculous”.